Editor's note: Earlier today we announced four new ways to help teachers engage their students using Google tools. This post dives deeper into one of the four announcements: creative apps on Chromebooks. If you’re at ISTE in Denver, visit us at booth #2511 in the expo hall to learn more and demo these apps. In 2015, Google commissioned research from the Economist Intelligence Unit to better understand the skills students need to be successful in the future workplace. In addition to literacy and numeracy, the research uncovered a wider range of skills — including problem-solving, teamwork, communication and creativity — that are most sought after by employers. With this inspiration in mind, we’re on a mission to discover Chromebook tools that can be seamlessly integrated into classroom life, while also fostering skills of the future. We reached out to teachers in Chromebook classrooms and collaborated with EdTechTeacher to identify Chromebook apps that nurture these skills. Three creative apps consistently bubbled up as loved by teachers and students alike: Explain Everything, Soundtrap and WeVideo. 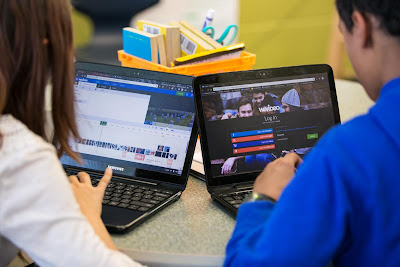 During our visit, students used WeVideo’s collaborative video creation tool in English Language Arts to edit documentaries about a flood that ravaged their town. In Science, they used Soundtrap’s spoken word and music-making platform to create public service announcements about how hand-washing kills germs. And in Math, they used Explain Everything’s interactive whiteboard to animate their thinking about histograms. A classroom that nurtures creativity often results in students taking different approaches to interacting with the same curriculum. “There are some students who are happy to express themselves verbally. There are others who prefer to write. There are students who don't like to have their face shown, but they’re more than happy to explain their ideas. With these apps, you can help everyone focus on their strengths,” says Bailey Triplett, Muller Road’s AVID Teacher. 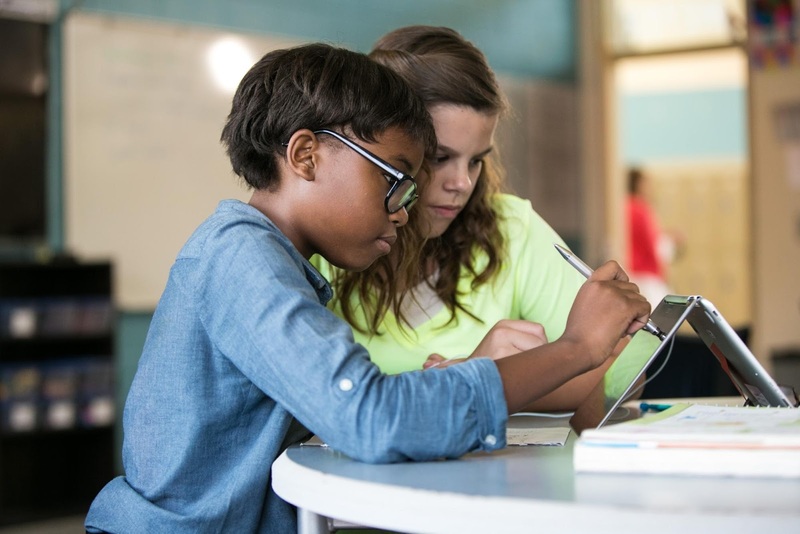 To make these creative apps on Chromebooks more accessible to a wider range of school districts, we worked closely with our Chromebook partners to create a special price when all three apps are purchased as a bundle. They may be purchased alongside Chromebooks or on their own, and they are available as an annual subscription per license from Chromebook resellers in the US. And we’re just getting started. We look forward to working with teachers and partners to bring even more 21st century tools into the classroom. To learn more about these apps, visit g.co/educhromebookapps, check out the apps’ websites, or contact your school’s Chromebook reseller. This entry was posted in Google for Education Blog and tagged Chrome, Chrome apps, Chromebooks, Chromebooks for Education, creative apps, Creativity, Education on June 27, 2016 by Googlefor Edu. Last October, we kicked off our annual Doodle 4 Google art competition, asking students to create a doodle to tell the world “What makes me…me.” This time around, we added a little twist: for the first time in eight years of Doodle 4 Google, there were no restrictions on the medium or materials kids could use to create a doodle. Kids took us up on the challenge. A quarter of all finalists used some non-traditional media—from clay and wood to origami, photographs and sheets of music—in their submission. Today, Googlers are hosting surprise assemblies at schools from Waterville, Maine to Waipahu, Hawaii to celebrate the winners of each state and thank the teachers and parents who have encouraged them along the way. And for the first time ever, we’re announcing winners for Washington, D.C., Guam and Puerto Rico. See all 53 State and Territory Winners on our website. Now, our finalists need your votes for a shot at having their doodle make it onto the Google homepage. Starting today through Feb 22, head to the Doodle 4 Google site to vote for your favorite artwork for each grade group. On March 21, we’ll announce the winner and four runners-up—and you’ll see the winning doodle on google.com. Check out this year’s talented set of finalists and vote for your favorite! This entry was posted in Google for Education Blog and tagged Creativity, Doodle4Google, Education on February 5, 2016 by Googlefor Edu. Today we’re kicking off the 2015 Doodle 4 Google art competition, where creative and curious students across the U.S. vie to take over the Google homepage for a day with their artwork. This year’s theme, “What makes me…me,” invites students K-12 to express themselves in the form of a doodle highlighting what makes them unique. But wait don’t get out those pencils just yet. This year, there’s a twist. Doodle 4 Google is now in its eighth year (if Doodle 4 Google were a kid, it’d be a third grader)—so we decided to mix things up a bit to let kids’ imaginations really run wild. 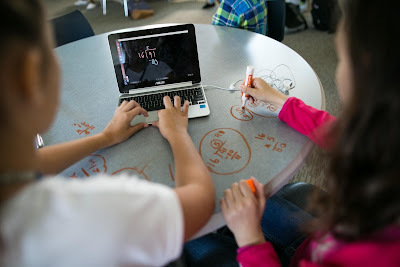 For the first time, there are no constraints on medium: students can cook, build, cut, spin, paint, or mold their doodle–basically use any material they like as long as they incorporate the letters G-O-O-G-L-E. The Doodle team itself has used a variety of unexpected materials over the years; for example, one Earth Day, we grew a bed of flowers to spell out the doodle. So we figured: let’s open the doors for all the creative kids out there do the same. Here you can see how I decided to express “me”! I made my doodle out of clay, baked it in the oven, and painted it with acrylic paint. The succulent was taken from my garden. See more tips from my team of Doodlers on the Doodle 4 Google website. We anticipate a whole lot of creative use of pottery, crochet, cookie dough and more by students (although of course we want all the drawings and paintings too! ), so we figured we need some help picking out the winning artwork. We have an amazing group of guest judges: professional basketball player Stephen Curry, astronaut Dr. Yvonne Cagle, director and author BJ Novak, professional soccer player Alex Morgan, Emmy-award winner Julie Bowen and animator Glen Keane (more on the judges on our site). Together, with the Doodle Team, we’ll pick one National Winner who will have their artwork displayed on the Google homepage for millions to see, receive $30,000 towards a college scholarship, and meet and work with the Doodle team on a visit to Mountain View, Calif. Plus, their school will get to spend $50,000 on technology. Submissions are open until December 7. And for teachers, check out some classroom ideas and activities to get your young artists ready to Doodle! This entry was posted in Google for Education Blog and tagged Creativity, Doodle4Google, Education on October 19, 2015 by Googlefor Edu.